The name stems from Native Americans, who called the nut "hetuck," which means "buck eye" (because the markings on the nut resemble the eye of a deer). 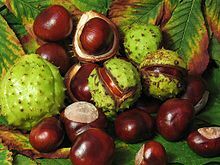 Any of several species of trees of the genus Aesculus. Aesculus hippocastanum, the horse chestnut. Any of several species of the related Mexican buckeye (genus Ungnadia). The seed or fruit of these plants. (US, slang) A native or resident of the American state of Ohio. (US) A confection made from peanut butter fudge partially dipped in chocolate to leave a circle of peanut butter visible, supposed to resemble the nut of the Ohio buckeye tree.